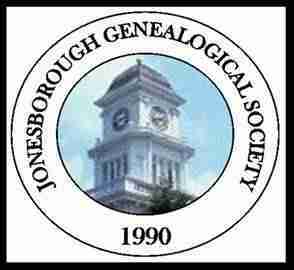 On Saturday, March 23, 2019, from 8 am to 4 pm, the Jonesborough Genealogical Society will host its seventh Tour of Washington County, Tennessee, where participants will see historic sites and sounds across our amazing county. 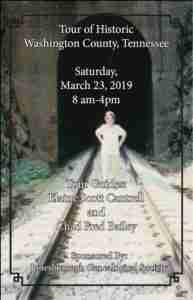 Elaine Cantrell, JGS Director, and Chad Bailey, JGS President, will be the tour guides across an eight-hour tour route, which will include much of Boones Creek, east of Interstate 26, including a ride on part of the old Gray Station Road and Old Stage Coach Road, as well as the Gump Addition of Johnson City. Participants will learn and see many sites in the communities of Jonesborough, Boones Creek, Knob Creek, Carroll Creek, Boone Station, Gravel Hill, Gray (Station), Cedar Creek, Princeton, Gump Addition, Carnegie, Brown’s Mill, Indian Ridge, Johnson City, and others. photographs of sites and sounds of Washington County. This tour will begin at the Jonesborough Visitor Center, 117 Boone Street, Jonesborough, at 8 am. Please arrive at the Jonesborough Visitor Center at least 30 minutes prior to loading, i.e. arrive at 7:30 to get on the bus. Parking will be available on a first come first serve basis at the Jonesborough Visitors Center. The bus will be loaded and leave promptly at 8 am. Participants will take a tour of the Boones Creek Telephone Exchange, Boones Creek Middle School, Knob View Farm, and other potential sites. Cost is $50 for JGS members and $55 for public. 25 seats are available. Click here to download the reservation form.